I am often asked to write strategies based on line break charts (e.g a three line break chart). I caution my clients that line break charts can be deceptive because they ‘hide’ price movement information. This can have its advantages in that it could give you a general sense of the direction of the market, however, as you will see in this tutorial, it can also be the reason why actual results are different from those seen in historical testing. 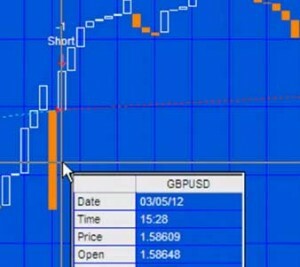 In this tutorial I use simple strategy (see the code below) to show how trades appear in real time (on a simulated account) compared with how they would have looked historically. In the image on the right I have applied the simple program shown below and left it applied to the chart as bars form in real time. I also printed asterisks below the ‘real time’ bars so that it is easy to distinguish them from the historic bars. 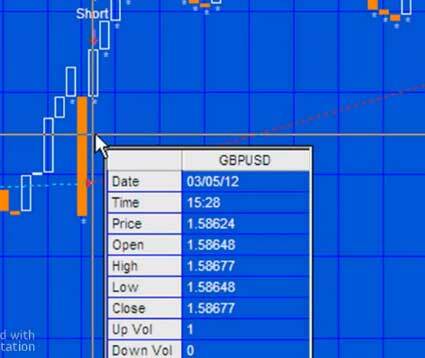 In the image you will see that there is a sell short trade well below the low of the 3 line break bar. The program applied to a chart after it is refreshed. When I refreshed the chart (using CTRL-R) the trade appeared as in the next image. 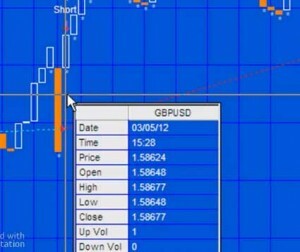 Notice that the short trade now appears at the low of the three line break bar rather than below it. I demonstrate this in the video below. Imagine how this difference could affect your strategies when applied to line break charts? In program 5 I created a strategy that used the advantages of the line break concept, but applied it to regular candlestick charts. This strategy may give you some ideas as to how you could develop similar strategies utilizing the line break concept.